The race to bring out the first foldable phone is on, with many different mobile makers testing out the waters. A patent, which the South Korean company applied for in 2017, was granted this week, revealing a Samsung foldable phone, which doubles as a gaming controller. Not only does this Samsung foldable phone fold into itself, it also has a flip out section with buttons on one side and a D-pad on the other. We already know about Samsung's rumoured foldable phone, the Galaxy X. The Galaxy X is expected to be revealed during Samsung's 20 February 2019 event. The event will be focused on unveiling the company's Galaxy S10 range. Nothing's been officially confirmed, and we probably won't hear anything about this new patented foldable phone which also doubles up as a game controller at the February 20th event. To give you an idea of what the patented Samsung foldable phone might look like if the company decides to make it a reality, LetsGoDigital made some pretty convincing 3D-renderings. Take a look in the gallery above. This Samsung foldable phone could be every mobile gamer's dream. 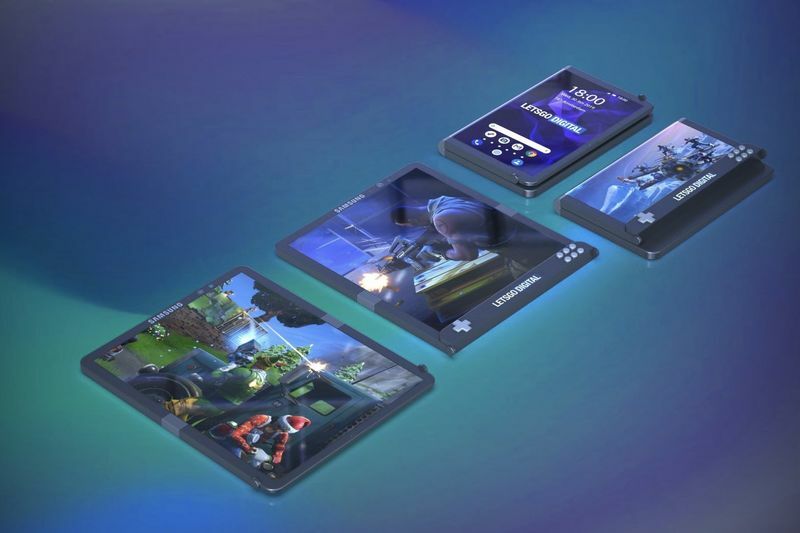 It features a large touch screen, which is always welcomed in the mobile gaming world, which then folds into a gaming controller, giving you a possibly unique mobile gaming experience. Samsung isn't the first tech company to bring out a concept of a foldable phone. Xiaomi recently revealed a prototype of a foldable phone, beating Samsung to the punch. However, Samsung could have an edge in terms of positioning this possible foldable phone as a gaming smartphone, with a cool, brand new feature.